Based on true events, here comes decades later a new reminder of what the Watergate scandal supposed to America. That a film is based on true events does not mean that everything that tells is 100% true. Surely the Richard Nixon portrayed here is far from the real Nixon, but … who cares? 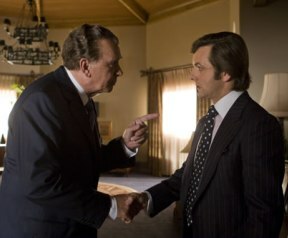 The point is that this Frost/Nixon offers much more to the spectator than the eye can catch at the beginning. A beautiful story that shows that no human is totally good or bad. Both Langella and Sheen /Nixon and Frost are far from perfect, but with a determination that makes them “dangerous” and always on the edge. The movie has many wonderful moments, like Nixon´s sentences before the shooting to try to make Frost lose concentration, or the amazing telephone conversation with Nixon drunk that leads to the turn of the events. On top of that, Oliver Platt, Sam Rockwell and Kevin Bacon are superb in their secondary roles. I thought before starting to watch the movie that this would be have another boring political plot, but far from it, it was smart, well directed, with rhythm and with superb acting skills, especially for Frank Langella who could have perfectly got the Academy Award for his personification. Good cinema! The worst: Many will think that Nixon´s figure should have been more demonized. The detail: Both Langella and Sheen had had the same roles in the theatre play before shooting this for the big screen.